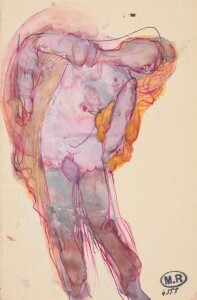 a) Drawing(s) of dancers by Auguste Rodin (find them within this blogpost and elsewhere online). b) You will also need a photo of a dancing figure. c) For drawing, have paper that is thick enough to cope with some water (approximately A4 is a good size) and either pencil or graphite stick. d) In addition, you will need a fairly large round paint-brush (e.g. size 6 or over) and your choice of watercolour paints or dilute ink. When to do this warm-up: To free you up mentally and physically before drawing or before working in watercolour. Set aside no more than 20 minutes for this exercise. To do: You have chosen a photo of a dancer – take a good look at it. Which parts of the dancer are moving? Which parts, if any, are supporting his or her weight? Also look at your chosen drawing by Auguste Rodin. 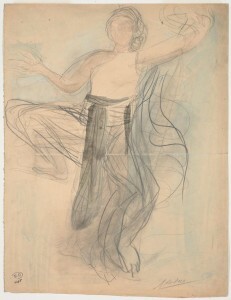 Notice how Rodin has used expressive lines to give his figure a sense of energy and movement. See how both the lines and colour wash are visible in his finished drawing. The sense of energy is more important than any sense of meticulous finish. When you are ready, you will draw the dancer from your photo using pencil or graphite stick. Decide where to position the figure on your sheet of paper. How big will you make the figure? If it gives you confidence, make a few initial light marks on the page to indicate where the main parts of the figure will go. Now proceed boldly with the drawing. 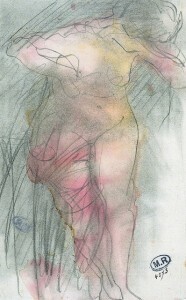 Have the Rodin drawing by your side for inspiration and aim for a similar effect. Using pencil or graphite stick, draw the figure with flowing, sweeping lines. Don’t labour over any details within the figure. A sense of energy and movement in this drawing is much more important than accuracy. Having drawn the figure, choose one to three colours to use within your design. Do not aim to mimic the actual colour of skin or clothing. Just choose colours that most appeal to you. Perhaps you have a tube or bottle of beautiful colour that you had bought purely because you loved it, but have since had little opportunity to use it? Or perhaps there are colours within your set that suggest “energy” to you? Using dilute ink or watercolour paints, add colour to your image in great sweeping strokes. You could leave the figure itself as white paper and create swathes of colour around him or her. Or you could apply colour to the figure itself. If so, be sure to apply the colour boldly, in as few strokes as possible. It is fine if your colour overlaps the lines of your drawing, or if white gaps are left between pencil lines and brush-strokes. 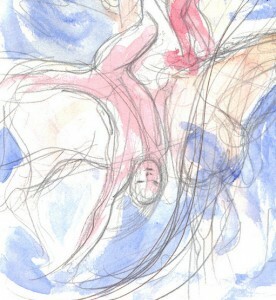 Above and below: My own warm-up drawings inspired by the drawings of Auguste Rodin. 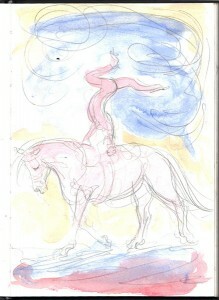 I based these on photos of equestrian vaulters. Pencil and watercolour wash.
a) Sketchbook or loose sheets of paper. b) A life model, still life, interior or landscape to draw from life. c) Any medium that flows across the page, e.g. pencil, flowing pen, graphite stick, etc. Any time! Continuous line drawing helps to get rid of inhibitions while also switching the brain to an artistically useful way of seeing. This warm-up is therefore perfect at the start of life-drawing sessions. 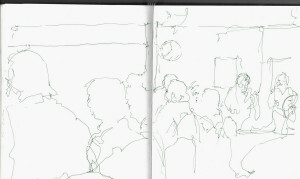 It is also good as a “mental ice-breaker” when you first get your sketchbook out in any situation, e.g. in a cafe or museum. The aim is to create a line drawing while barely lifting your drawing tool off the paper. Aim to include both foreground and background in your drawing. For example, if you were to make a continuous drawing at the start of a life drawing class, you would’nt just draw the model herself, but would include something of her surroundings. So your drawing could include the life model, something of the floor in front of her, and the wall / doorway/ easels, etc. behind her. You might even include other people within your drawing if you can see them in front of you. 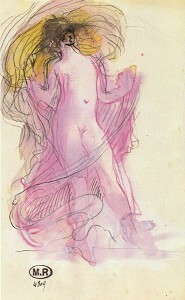 Above: A warm-up drawing made just before a jazz concert. Start drawing near the centre of your page. A good place to start your drawing is at a point where two to three lines meet. In a studio, cafe or other interior, that could mean starting at the corner of a doorway. If working outdoors, you might want to start your drawing at the point where a building meets the horizon, or at the point where strong tree branches cross each other. Let your pen flow across the page. You might, for example, start drawing the edge of a doorway, and then let your pen glide from there into drawing the edge of a person who is standing in front of that doorway. To get your pen from one edge of the figure to the other, you can make up an imagined line that crosses the inside of them, perhaps following the folds of their clothing or the edge of a shadow. You might, at times need to double back on yourself to take the pen back to a point at which a fresh line should branch off. The drawing should look quite scribbly. Don’t worry – it is only a warm-up. To maintain some sense of reality in the picture, try to include the edges of things as they slope away from you into the distance. In an interior, that means including edges such as where the walls meet the ceiling and floor as well as door-frames and windows. In a landscape, try to include the edges of paths, roads and hedges as they slope away towards the horizon. 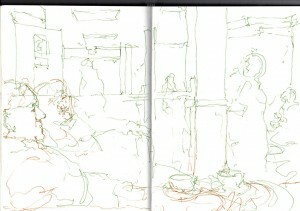 Above: This sketchbook cafe drawing started as a continuous line warm-up. I then added a few lines of a different colour in the foreground. a) A small piece of primed canvas or canvas paper or gessoed board. It should be about 25 by 18cm. b) A set square and pencil. c) Oil paints, brushes, palette, turpentine or other thinner, etc. d) An object to draw, e.g. a piece of fruit. You might want to put this onto a piece of white or coloured cloth. At the start of an oil-painting session, especially if you are returning to oil painting after a long break and need to get back into the swing of it again. This is my longest warm-up exercise. It takes a full hour of intensive painting if you paint the full six views! Use set-square and pencil to divide your canvas into a grid of six equal rectangles or squares. By all means, leave a rim of blank canvas around the edge if this makes it easier to measure out. Rectangles of 8cm x 6cm would be fine. 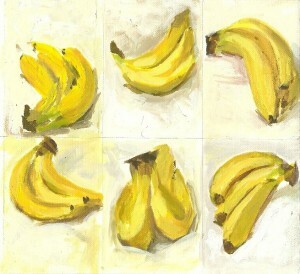 The aim is to paint the object very rapidly and simply in an alla prima fashion. Time yourself a strict ten minutes to paint the object within one retangle. 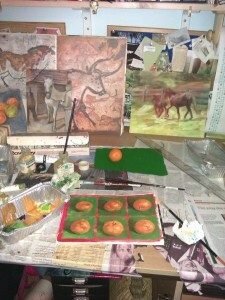 Then rotate the object and paint a fresh view of it. Continue until you have filled your grid. Before you start, I suggest that you make a decision about which colours to use. It is generally best to restrict yourself to just 3-5 colours, plus white, as you’ll be working rapidly here. For example, a palette of cobalt blue, alizarin crimson and yellow ochre plus titanium white is successful in many situations. Or you may have your own preferred combination. For each little image of your object, decide how to place it within its allotted rectangle. If you wish, draw a quick outline using turpentine-thinned paint on the tip of a brush. Then proceed boldly, blocking in dark and light tones of thicker paint where they occur on the object and on its immediate background. You may like to half-close your eyes in order to see the tones on the object more clearly. If you can multi-task at this speed, make simple decisions about where the colour of the object and background are “warmer” (i.e. more orange) and where they are “cooler” (i.e. more blue) and apply juicy brush-strokes of colour accordingly. Top tip: Don’t try to match colour exactly. Just aim to clarify where the lights and darks are and, if possible, where warm and cool areas are. 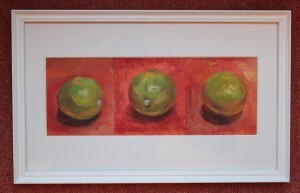 Above: My limes in oils. Just three views this time.